Last year Stephen Oppenheimer published yet another article on the mitochondrial DNA tree and his vision of the molecular clock applied to the human matrilineages. 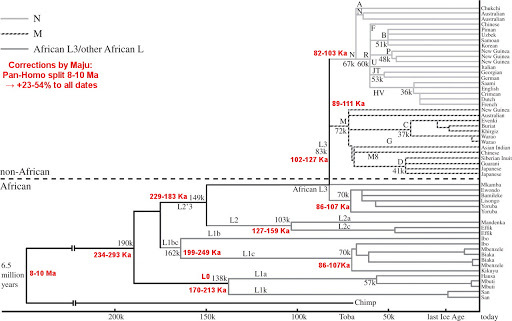 The centerpiece of the article is fig.2, a mtDNA tree with his “molecular clock” estimates of the ages of the haplogroups. Sadly it has a major problem: the resulting dates have a horrible fit with all the archaeological and paleoclimatic evidence and even with the most recent estimates for the Pan-Homo split. Much of the article (all section 1.b) is dedicated to attempt to justify his so-called “calibration” methods, which are in the end based on a self-reference: Soares 2009, of which Oppenheimer was co-author and which was calibrated assuming a Pan-Homo split age of 5-6 Ma. In annoyingly pointless circular reasoning, Oppenheimer manages now to estimate the Pan-Homo split at 6.5 Ma using the Soares 2009 “molecular clock” rates. All these Pan-Homo split age guesstimates are horribly wrong, because Sahelanthropus tchadiensis (c. 7 Ma ago) was already in the Homo line (and not anymore in the Pan one) and also because several other authors have estimated the Pan-Homo divergence age to be at least 8 Ma old, and maybe as ancient as 13 Ma (Langergraeber 2012). This does not mean that the red colored dates provided here are necessarily the correct ones, although in many cases they do seem to fit much better with the archaeological and paleoclimatic data, especially at the lower ranges. It is merely a simple “first aid” correction to Oppenheimer’s necessarily incorrect estimates. Other factors must be taken into account, for example I do not believe for a second that M is older than African L3 branches, which show only one or, in one case, two coding region mutations downstream of the L3 node, while M is three mutations downstream and N five. Oppenheimer seems determined to count HVS mutations for example and to estimate age counting from the present forms (which could well be frozen in time for many many millennia because of “drift out” phenomena if the population was large enough but not too large, which would tend to freeze the hegemonic lineages in my modeling tests, while removing any novel ones). I do not propose any alternative “molecular clock” for mtDNA because I feel that it poses way too many issues because of irregular branch length. Maybe in the future some brilliant geneticist (or maybe mathematician?) will be able to posit a reasonably good refurbished “molecular clock” for mtDNA but at the moment I know of no one. I’m just stating the obvious: what Oppenheimer is selling is necessarily wrong. Unlike the conceptually akin paper by Fu 2013 (PPV – discussed here), this one is very neatly explained and allows no doubts on how they reached their conclusions. Another thing is to agree with the method being good enough to provide for any conclusions at all. It is still an interesting study on the evolution of mtDNA lineage H in the specific context of the Elba-Saale region of Germany. Haplogroup H dominates present-day Western European mitochondrial DNA variability (>40%), yet was less common (~19%) among Early Neolithic farmers (~5450 BC) and virtually absent in Mesolithic hunter-gatherers. Here we investigate this major component of the maternal population history of modern Europeans and sequence 39 complete haplogroup H mitochondrial genomes from ancient human remains. We then compare this ‘real-time’ genetic data with cultural changes taking place between the Early Neolithic (~5450 BC) and Bronze Age (~2200 BC) in Central Europe. Our results reveal that the current diversity and distribution of haplogroup H were largely established by the Mid Neolithic (~4000 BC), but with substantial genetic contributions from subsequent pan-European cultures such as the Bell Beakers expanding out of Iberia in the Late Neolithic (~2800 BC). Dated haplogroup H genomes allow us to reconstruct the recent evolutionary history of haplogroup H and reveal a mutation rate 45% higher than current estimates for human mitochondria. Let’s deal with the interesting part first and then with their impossible molecular clock speculations. All the samples used in this study belong to haplogroup H as you can see in table 1. This does not allow to consider the overall apportion of H in each population, for which we would need to go to the original studies. For example in the region’s LBK samples, H was just some 20% of the total, what alone talks of a population that was not at all like the modern one, never mind N1a. On the opposite side of the spectrum are the Bell Beaker (BBC) samples, where H made up 88% of the total (Adler 2012, discussed here), again non-modern but a possible source of H increase in frequency. We must keep in mind all the time that in this study only H is considered, with all the derived pros and cons. Figure 2 | Population affinities of select Neolithic cultures. (a) PCA biplot based on the frequencies of 15 hg H sub-haplogroups (component loadings) from 37 present-dayWestern Eurasian and three ancient populations (light blue:Western Europe; dark blue: Central and Eastern Europe; orange; Near East,Caucasus and Anatolia; and pink: ancient samples). Populations are abbreviated as follows: GAL, Galicia; CNT, Cantabria; CAT, Catalonia; GAS, Galicia/Asturia; CAN, Cantabria2; POT, Potes; PAS, Pasiegos; VIZ, Vizcaya; GUI, Guipuzcoa; BMI, Basques; IPNE, Iberian Peninsula Northeast; TUR, Turkey; ARM, Armenia; GEO, Georgia; NWC, Northwest Caucasus; DAG, Dagestan; OSS, Ossetia; SYR, Syria; LBN, Lebanon; JOR, Jordan; ARB, Arabian Peninsula;ARE, Arabian Peninsula2; KBK, Karachay-Balkaria; MKD, Macedonia; VUR, Volga-Ural region; FIN, Finland; EST, Estonia; ESV, Eastern Slavs; SVK, Slovakia; FRA, France; BLK, Balkans; DEU, Germany; AUT, Austria, ROU, Romania; FRM, France Normandy; WIS, Western Isles; CZE, Czech Republic; LBK, Linear pottery culture; BBC, Bell Beaker culture; MNE, Middle Neolithic. Fig. 2a annotated by Maju: green “MNE” cultures, grey: other cultures. Dotted circles just for reference. Suddenly the mirage of modernity and homogeneity in MNE’s H collapses, very specially for Salzmünde (2/2 H3) but really also for the other components of the MNE pool: Rössen (directly derived from LBK) appears here as Balcano-Estonian and similar to Bronze Age Sardinia, Schöningen (derived from Rössen) appears Norman French and close to the original LBK pool, the first Kurgan culture in Central Europe, Baalberge, is the only one really close to the MNE dot but its closest modern relatives are NE Iberians (IPNE), while its successor Salzmünde is “hyper-Iberian” much as Bell Beaker after them – however the intermediate Corded Ware, C.W., leans back to the right and appears Catalan. Fig. 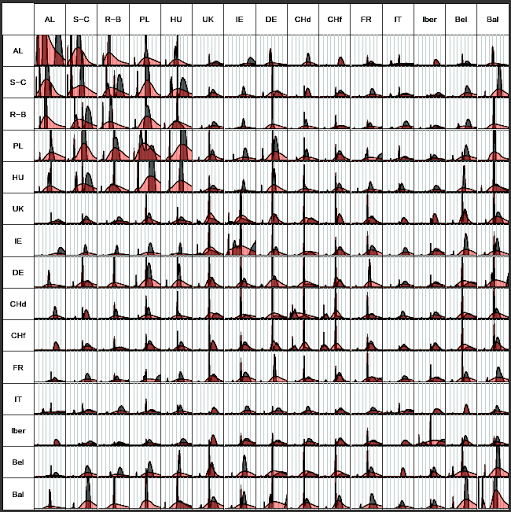 2a annotated by Maju: changes in Central European mtDNA H composition along time (arrows). I considered here Rössen as different from Schöningen, as Rössen or Epi-Rössen persisted in much of Germany and nearby Alpine areas for long, but feel free to draw or imagine it differently. 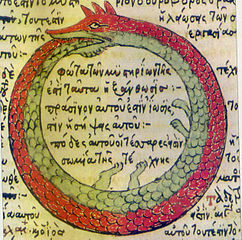 Whatever the case the appearance is of gradual “modernization” or “Germanization” of haplogroup H culminating in Baalberge, followed by an “Iberization” of the haplogroup pool in the Middle and Late Chalcolithic, coincident roughly with the expansion of Megalithism and Bell Beaker and just mildly countered by Indoeuropean expansion from the East (Corded Ware, Unetice). Here they mention six Unetice H sequences but, judging on Adler 2012, H was very very rare in this culture at least in the Elbe-Saale area (1/31). Beyond this I doubt that the paper can provide us with any more enlightenment. It does provide for some false leads however. Another major advantage of the temporal calibration points provided by ancient hg H mt genomes is that the data allow a relatively precise estimate of the evolutionary substitution rate for human mtDNA. The temporal dependency of evolutionary rates predicts that rate estimates measured over short timespans will be considerably higher than those using deep fossil calibrations, such as the human/chimpanzee split at ~6 million years. It doesn’t really matter but it illustrates the reactionary scholastic inertia that plagues the Academia, very especially in the field of population genetics. (…) The rate calibrated by the Neolithic and Bronze Age sequences is 2.4 x10⁻⁸ substitutions per site per year (1.7–3.2×10⁻⁸; 95% high posterior density) for the entire mt genome, which is 1.45 (44.5%) higher than current estimates based on the traditional human/chimp split (for example, 1.66 x10 ⁻⁸ for the entire mt genome and 1.26x 10⁻⁸ for the coding region). Consequently, the calibrated ‘Neolithic’ rate infers a considerably younger coalescence date for hg H (10.9–19.1 kya) than those previously reported (19.2–21.4 kya for HVSI, 15.7–22.5 kya for the mt coding region or 14.7–22.6 kya when corrected for purifying selection). What matters is that by cherry-picking only some sequences of ancient mtDNA H, they are denying themselves (and the rest of us by extension) a realistic calibration of the haplogroup. What happened with the Cantabrian Magdalenian and Epipaleolithic Basque H? What happened with Epipaleolithic Karelian H? Never mind Sunghir’s Gravettian H17’27 or Taforalt’s massive pool of R*-CRS, most likely H1 (Kéfi 2005), which may be more questionable but never rejected without direct negative evidence. In other words: they are cherry-picking the evidence. They could argue that the Elbe-Saale data was the only one readily available for them to sequence in full or whatever and that therefore the evidence was cherry-picked by Destiny… but that would not justify in any case the arrogance of their conclusions: they should have been much more humble and admit that this evidence is only part of all the ancient mtDNA H (known or suspected), some of which is clearly much older and therefore much more relevant. Fig. 1a, annotated by Maju. In orange color I have marked an alternative minimal “molecular clock” extrapolation using the La Chora H6 sequence (Hervella 2006 open access). This is minimal because I’m assuming this sequence to be underived H6, if it’d be derived (what I don’t know), the estimate would be even larger. 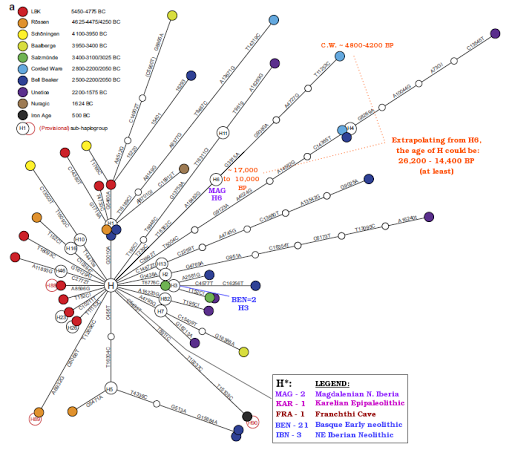 I have annotated all the sequences I am aware of ancient confirmed (unquestionable) mtDNA H. There are many more that are very likely, and in many cases older (see maps), but not yet confirmed. So well, molecular-clock-o-logical pseudoscience again. It’s a pity that otherwise respectable scientists pay tribute to this academic fetish. The molecular clock hypothesis has never been proven, being a mere statistical construct, and it has many problems particularly in mitochondrial DNA, where branches are dramatically unequal, obeying to either: (a) randomness, (b) differential adaptive fitness or (c) ancient population dynamics (variable drift results depending on population size). I discussed some of that here and also here. I beg here to population geneticists to be more serious and careful and not try to push their ideas against the available evidence. That is not proper of scientists but belongs to the field of ideological propaganda. 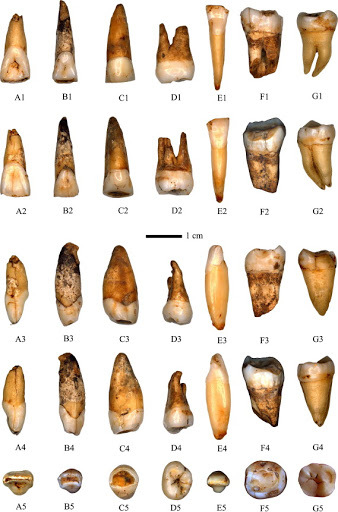 Update: La Chora Magdalenian H6 is probably H6a1, with implications for the age estimate of H.
All known H6 of Iberia and all or most of Western Europe is H6a1, while the “famous” Central Asian H6 (very minor overall) is all H6(xH6a), which is also relatively important in Eastern Europe. See Álvarez Iglesias 2009 (open access), especially Supp. Table 3. H6a(xH6a1) has only been detected so far in Austria (oversampled – I miss data from France again). Brotherton’s H6 only sample (Corded Ware) is H6a1a. Álvarez Iglesias did not test for this phylogenetic level, hence would show in his data as H6a1 but he did test for H6a1a1, only found precisely in Cantabria. Of course I do not really think that the molecular clock can be easily applied, if at all, to mtDNA, because the rarity of accumulating mutations poses way too many challenges. But if it had to be applied, as Brotherton, Fu, their teams and some amateurs seem to think, then we’d have to test the La Chora and La Pasiega (and Sunghir and others) for coding region mutations in order to have the most valid calibration points. Otherwise is like the blind man who touched the trunk of an elephant and imagined it was like a snake.